Play Sticks are supposed to be concealer, foundation and powder all in one. Who wouldn’t want to apply all of these in the form of a stick. I’d love to get this just to see if it actually any good or if it is just all hype. I love trying out concealers and I really love the sound of a hydrating crease control concealer. I find that a lot of my concealers do crease throughout the day so I would really like to try this one and see if it works. I’ve wanted to try Hoola for a while because I’ve heard great things about it. I really like the idea of a completely matte bronzer because a lot of bronzers seem to have some kind of shimmer in them and I think I would prefer a matte bronzer. One of the things I really like about Rockateur is its packaging, it is just so cute. Obviously, I really like the actual product itself too, with its gorgeous rose gold shimmer so it is a win win. This powder just looks stunning and I think it would be so pretty on cheeks. Girl Meets Pearl has been called “liquid pearl” for your face. It is a dewy luminizer that is perfect for highlighting your cheekbones, nose, forehead and cupid’s bow. I would love to try out this product. I hope you liked this post. If you did, please give it a like on Bloglovin or a +1 on Google Plus. 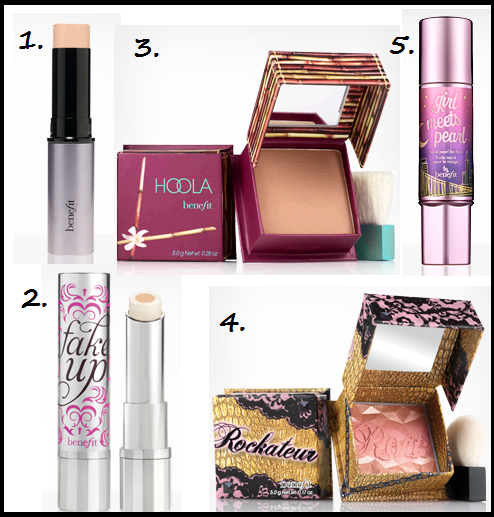 What are the Benefit products that you really want to try? Leave a comment down below. Previous Post The Mirrorless Makeup Challenge!